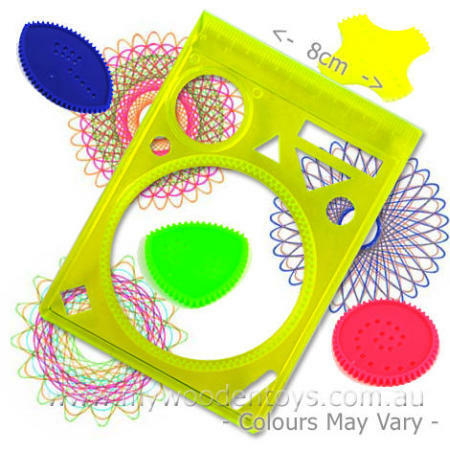 Mini Spirograph is a simple inexpensive little version of this classic toy which allows you to make wonderful spiraling patterns. All you have to do is place it on paper choose one of the 4 shapes and place it inside the big circle and against the cogs at the edge. Put a pen (fineliner works best) and start to push or pull the shape around the circle making sure it stays up against the cogs. You will magically start to see a beautiful pattern developing on the paper. You can then change the shape and make a new pattern or add to the one already started. We like this because: "really fascinating little toy."